There were so many reasons to celebrate our destination last year – world-class festivals and events, intriguing public art installations, industry recognition and a growing squad of tourism ambassadors. #SaintAwesome’s tourism momentum is still reverberating in these early days of the New Year. At the end of November, Saint John’s room sales were tracking up 3.8% over 2016 which ended 5.8% over 2015! And the 2017 cruise season at Port Saint John provided a 3% year-over-year increase with 208,818 visitors from cruise ships in 2017 as compared to 202,929 in 2016. It’s another year of solid growth with final stats due early in this year. Is it another record-breaker? 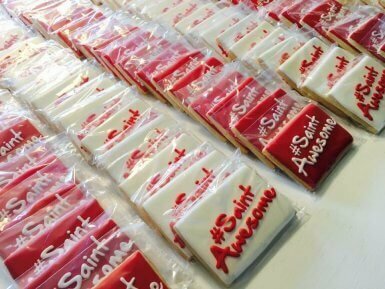 Did you know #SaintAwesome has been used over 16,352 times on Instagram alone?! Visitors, residents and the local business community continue to celebrate all the amazing things happening in our city with this uniting hashtag. Not to mention, Discover Saint John’s 30-second TV spot won a SILVER at the 2017 Summit International Awards adding to its collection. The #SaintAwesome creative has also won GOLD for a transit wrap and BRONZE for digital advertising. Meetings + Incentive Travel’s readers nominated their favourite venues and suppliers and then cast 1,893 votes to determine the winners of the magazine’s annual Readers’ Choice Awards. Discover Saint John was thrilled to be awarded an Honourable Mention for Best Destination Marketing Organization! Applause to our great sales team and industry partners helping to sell #SaintAwesome. The East Coast Music Awards lit up the city with killer performances and industry meetings generating over $3M in economic impact. Our venues, volunteers and audiences wowed the ECMA team and proved once again Saint John is the perfect host. This spring the city hosted 18 Quebec Major Junior Hockey League teams and over 200 midget-aged elite prospects and their families at the 2017 QMJHL Midget Entry Draft at Harbour Station. The event, which created $1.5M in economic impact, saw Hampton-native Jaxon Bellamy go to the rival Moncton Wild Cats in the first round! Let’s Go Sea Dogs! 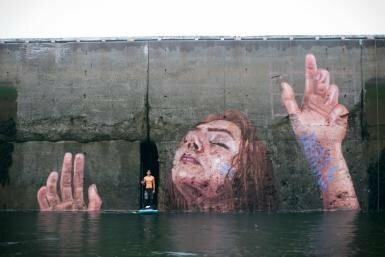 When we invited world-renowned street artist HULA (Sean Yoro) to battle the world’s highest tides we knew the world would watch. HULA captivated the city for 10 days painting the beautiful ‘HUNA’ on his paddle-board in the heart of uptown Saint John. 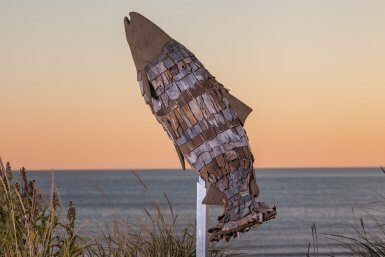 HULA’s work was featured on the front page of CNN.com and has been shared thousands of times around the globe helping to tell the story of the tides in #SaintAwesome. Shout out to Strong & Free Canada for being a terrific sponsor. Kudos to the AREA 506 Festival for winning the best new tourism product from the Tourism Industry Association of New Brunswick. The waterfront festival comes to life each year inside a shipping container city built on the edge of the world-famous Bay of Fundy. Our Canada 150 Cargo-tecture Design Competition, funded by the Government of Canada, took out-of-the-box thinking to a whole new level. 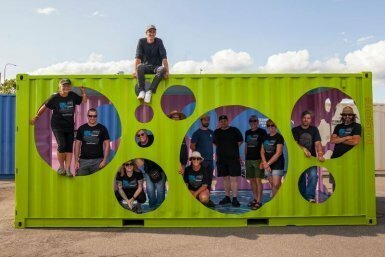 Five design teams were chosen to transform recycled shipping containers and the results blew our minds! Four of the shipping containers are now legacy public art installations – unexpected and intriguing celebrations in our port city. The three-day Saint John Festival of Sail commemorating Canada’s 150th anniversary brought 11 tall ships to the Saint John harbour and over $10M in economic impact. Visitors and locals alike marveled at the international fleet of tall ships celebrating our rich heritage and maritime history. One of the best parts of 2017 was it set us up for some amazing future years with WINS like the 2018 Hockey Canada World U17 Hockey Challenge and the The Red Knights International Firefighters Motorcycle Club 2021 Annual Convention. Happy New Year from Team #SaintAwesome!